Like its predecessor, the surprise 2017 hit film, ‘Happy Death Day,’ the follow-up offers a riveting comic tone to its exploration of how having a brush with death can convince even the most conceited person, like Rothe’s heroine, Tree, to start an entirely new life, during which they’ll never repeat their old mistakes again. But the sequel, which was directed by returning series helmer, Christopher Landon, further explores the powerful message that a reformed protagoinst can truly become a remarkable leader in bringing about change in the most difficult situations, no matter how many times they have to reinvent themselves in the process. 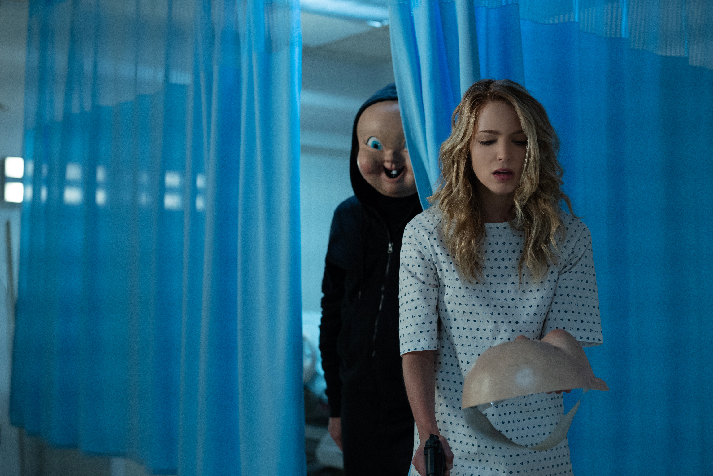 ‘Happy Death Day 2U,’ which Universal Pictures is releasing tomorrow in theaters, picks up the morning after the ending of Tree’s time loop, as she finally starts her romance with Carter (Israel Broussard). However, their happiness is short-lived, as his roommate, Ryan (Phi Vu), soon realizes that he’s now trapped in a time loop of his own. Ryan, who’s a science major, is happy to discover that the machine he’s building with his lab partners, Samar (Suraj Sharma) and Dre (Sarah Yarkin), for his thesis seems to finally to be working. But the trio is surprised to discover that the device generated a higher concentration of energy than they expected around the moment Tree got stuck in her time loop, which came to a close when she solved her own murder. Ryan also begins to panic when his day also leads to his own death. The person who’s determined to murder him is wearing the same baby mask that serves as their university’s mascot, which Tree’s former roommate, Lori (Ruby Modine), also wore while pursuing her in the first film. After Ryan relives his death day for the second time, Tree realizes that he’s now stuck in his own time loop, and she must help figure out why the cycle was passed on to Carter’s roommate. Along with the help of Samar and Dre, Tree, Carter and Ryan discover that the apparatus started the time loop, and Tree’s repeated reliving of her death day have thrown multiple universes off-balance. So Tree and Carter are forced to help Ryan and his fellow science majors find a way to put the multiple universes back on track, so that the time loops can finally close, and they can all carry out their true destinies.